Rather, it’s that in the close to three years in which I’ve been cooking along with Ellise over at Cowgirl Chef in our monthly Let’s Lunch Twitter lunchdate, I’ve been thinking: Why isn’t this woman writing a cookbook? I’ve salivated over her black pepper strawberry scones, sundried tomato pesto palmiers and far more, thinking all of these need to be compiled in a book somewhere. Well, that time has come — Ellise’s cookbook hits bookstores May 15 and I couldn’t be happier for her. Now, I’m fairly new to making tacos at home, having been turned onto them recently by Joe Yonan, a fellow Let’s Luncher, whose lovely cookbook “Serve Yourself: Nightly Adventures in Cooking For One” has a recipe for great breakfast tacos. Since then, I’ve pretty much decided that tortillas lend themselves well to just about everything. So why not a hearty curry? I immediately thought of a Goan pork curry a Singaporean friend taught me, a recipe handed down by his Indian immigrant grandmother. It’s vinegary, spicy and gingery all at once — a complex combination of flavors that’s unforgettable. This curry is terrific with plain white rice and, it turned out, delicious on tacos as well, topped with cilantro and a dab of cucumber raita to cool you down. So, enjoy y’all. And to Ellise — cheers, happy book launch and merci beaucoup for being such a wonderful cooking partner! Don’t forget to check out the Let’s Lunchers’ cross-cultural dishes below! And if you’d like to join Let’s Lunch, go to Twitter and post a message with the hashtag #Letslunch — or, post a comment below. Cilantro for garnish; Tortillas for serving. Combine pork, salt, pepper, garlic, ginger, pounded mustard seeds, turmeric, chili powder and apple cider vinegar in a large bowl. Mix well so each pork piece is well-coated with the marinade. Set aside 1/4 cup of chopped onions then stir the rest of the onions in with the pork. Let this mixture marinate for at least two hours. Heat vegetable oil in a wok over high heat, until oil is glistening. Add 1 TB mustard seeds and stir-fry until they become fragrant and start to really pop. Add 1/4 cup reserved chopped onions and curry leaf and stir-fry until fragrant. Then add pork mixture to the wok and stir-fry well. Once pork is mostly cooked, add two cups of water, if you want gravy. Let the mixture simmer until pork is cooked through. Heat up tortillas. Place a few tablespoons of pork curry onto each heated tortilla, top with cucumber raita (recipe below) and cilantro garnish and serve. Mix all ingredients in a bowl, season with salt. Chill until ready to serve. 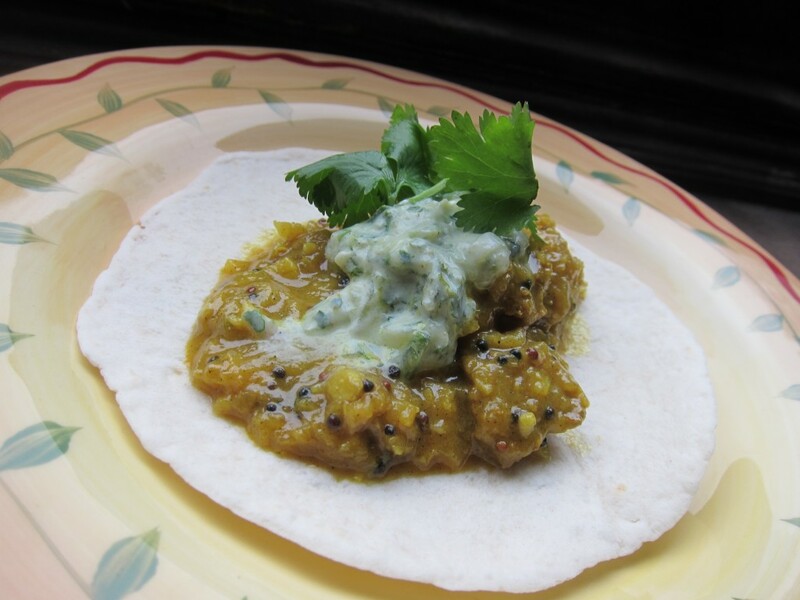 This entry was posted in Asian, Indian, Let's Lunch, Mexican, Recipes and tagged Cowgirl Chef, Goan, Pork Curry, Tacos by Cheryl. Bookmark the permalink. And how did I miss the update about Elise’s book. Must go check it out! What a talented bunch. Pingback: Let’s Lunch! The Fusion Episode…. Great theme this month, Cheryl!! And these tacos look delicious. Can’t wait to try them out! I’m so touched…and felt soo proud and excited for you, too, when your book came out! So thank you…thank you for this heartfelt post, and for your unwavering support over the last three (!!) years. I can’t believe it, can you? And to think it all started with bacon. We’ll always have that, won’t we? I’m making these tacos, too, by the way. Tortillas + curry! Love it! Love sound of this Goan pork curry. Very interesting addition of vinegar in a curry, have to try this. Gr8 to see you use a wok to make this, yay. Excited about Ellise’s new cookbook, so unique! Yum, yum, yum! This sounds delicious! Thanks for organizing another brilliant LetsLunch theme. I love how creative everyone got this month! Love this combo and a friend just gave me a sprig of curry leaves and I was wondering what to go for – now I know..THIS! Always love having “lunch” with you. What a fun dish! Tacos really are a great vehicle for all sorts of things. It sounds like a nice combination of textures and flavors,too. My how the Let’s Lunch group has grown! I love it! & Great recipe as always Cheryl. Mexican-Indian fusion is such a hot idea right now. There’s a resto & food truck fleet in SF called Curry Up Now, they do a tikka masala burrito… omg! Looks like your recipe would be amazing with a Mango Lassi drink. Loved yours, too! I’d never thought of putting fermented tofu in a pasta dish. Now I’ve got to try that! Oh curry and tacos absolutely go together. I’m sure I’ve had Indian curry tacos before, but not with the Singaporean twist! Would a sprinkling of roasted peanuts be out of place here? Maybe the seeds add the crunch texture I’m thinking of. With or without, this sounds fab! What a fun topic to write about! I love the culinary mash-ups this month and I’m putting your curry tacos in my “must try” file. Loved reading about your rice pudding, too — as much as I love eating it, I’ve never made it. Will try your recipe soon! I was thinking to myself that the only curry I’ve had that uses vinegar is a vindaloo and when I googled it, vindaloo is Goan! Where did you get the inspiration for the curry? I love trying different fillings in tacos (tau yu bak is quite amazing) and this will be up next! That sounds amazing — and I’m going to have to check out that cookbook! Sounds like it’s right up my alley. You should definitely get it — if you like French flavors and spicy Tex-Mex, it’s a must!